CHICAGO, Illinois, November 23, 2012 (ENS) – A variety of electric motors that use no rare earth minerals are being developed in the United States to power future generations of electric vehicles. Private U.S. companies, universities and national government laboratories – working alone and in collaboration – are designing and beginning to manufacture electric motors without rare earth minerals that are expensive and in limited supply. Earlier this month, the Chicago startup company Hybrid Electric Vehicle Technologies (HEVT) won the $250,000 grand prize in the national Cleantech Open competition with its patented switched reluctance motor. Rare earth minerals with magnetic and conductive properties are used in hybrid car batteries and in most of today’s electronic devices. China supplies nearly all of the world’s supply of rare earths. These minerals are found in other countries, including the United States, but are difficult to mine safely. China controlled the world’s supply due to low labor costs and lax environmental regulations. In August, China announced it would cut production of rare earths by 20 percent to improve the environment and consolidate the industry, prompting complaints to the World Trade Organization by countries that produce hybrid cars. On Wednesday, the Chinese government changed its policy and announced a subsidy for rare earth producers, but in the meantime, other sources of rare earths are being developed and so are technologies that avoid dependence on these minerals. HEVT’s switched reluctance technology avoids the use of rare earths by creating mechanical energy with a rotating disc inside a stationary disc. The switched reluctance motor offers a greater range of speed and a higher torque than conventional motors, but vibration and noise problems have limited its application in the past. HEVT has changed motor’s design and employed software to alleviate these problems. HEVT says its patented switched reluctance motor allows the company to design systems to hybridize existing powertrains or develop all new powertrains. “We have experience with over 20 powertrain designs and configurations, including a hybridized fully series-parallel Ford F-150 platform,” the company says. HEVT is now seeking investors to help it supply motors to the electric bike market. HEVT is part of a team, with the University of Texas at Dallas and General Atomics, designing a better motor for electric vehicles without rare earths. The first phase of this research is funded with $3 million from the U.S. Department of Energy’s ARPA-E program, a project approved in May. The ARPA-E program is also funding other entities with different design ideas for electric motors that avoid the use of rare earths. QM Power, based in Lee’s Summit, Missouri, is developing motors would contain magnets that use no rare earth minerals, are light and compact, and can deliver more power with greater efficiency and at reduced cost. Key innovations in this $2 million ARPA-E funded project include a new motor design with iron-based magnetic materials, a new motor control technique, and advanced manufacturing techniques that reduce the cost of the motor. The ultimate goal of this project is to create a cost-effective EV motor that offers the rough peak equivalent of 270 horsepower. Baldor Electric Company, based in Richmond Heights, Ohio, has a $2 million ARPA-E grant to develop a new type of traction motor that is light, compact, contains no rare earth materials, and has the potential to deliver more torque at a lower cost. The University of Alabama is developing rare-earth-free nanostructure magnets. Researchers say these new iron and manganese-based composite materials for use in EV electric motors will demonstrate magnetic properties superior to today’s best rare earth magnets. “Alternatives to rare earths will contribute to the cost-effectiveness of EVs and wind generators, facilitating their widespread use and drastically reducing the amount of greenhouse gases released into the atmosphere,” says the university in a statement announcing its $823,000 award from ARPA-E.
With its $1.6 million ARPA-E grant, the Ames National Laboratory in Ames, Iowa will develop a new class of permanent magnets based not on the rare earth mineral neodymium used in today’s most powerful magnets but on the more commonly available element cerium. Cerium is four times more abundant and less expensive than neodymium. Ames Lab will combine other metal elements with cerium to create a new magnet that can remain stable at the high temperatures typically found in electric motors. Another federal government lab, the Pacific Northwest National Laboratory, also has a $1.6 million ARPA-E grant to develop a manganese-based nano-composite magnet that could serve as an inexpensive alternative to rare-earth-based magnets. The manganese composite, made from low-cost and abundant materials, could exceed the performance of today’s most powerful commercial magnets at temperature higher than 200°Celsius. PNNL’s research team plans to leverage supercomputer modeling and materials testing to meet this objective. 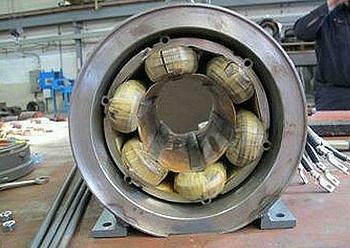 Manganese-based magnets could withstand higher temperatures than their rare earth predecessors and potentially reduce the need for any expensive, bulky engine cooling systems for the motor and generator.